Fort Lauderdale, October 2003. We were at the official presentation of the new open by Palmer & Johnson, another of those names that can boast "planetary" fame. A history that began in 1918 with wooden fishing boats and then continued with vessels that were extremely technical but rich in personality. A boatyard that grew in the image and resemblance of its original owner, Mike Kelsey, who was for years something of a "deus ex machina" for United States boating and a long time president of the NMMA. Under his guidance, and for a protracted period of time, Palmer & Johnson boats were the tops for the New York financial elite, but also many other national and international customers purchased sailing and motor vessels. "Time", "Galileo" and "La Baronessa" were only some of the great boats produced in that period. Then Kelsey got ill and with him his "gem", which found itself facing its first economic difficulties. So it came about that after so many years Palmer & Johnson changed "helmsman" and was taken over by a businessman very well known in the States, M.C. Kelvey, best known as owner of Monster, the biggest online personnel recruiting service in America and the world. However things did not improve; indeed after a couple of years, in 2003, the yard came close to bankruptcy. The rest is topicality because immediately afterwards Palmer & Johnson was taken over by Timur Mohammed, an English entrepreneur and former professional cricketer. He bought both production units: the one in Savannah, better known as Intermarine Savannah, and the historic one in Sturgeon Bay, Wisconsin. To manage the concern he took on another Kelsey, Mike Jr., son of the late "president", with instructions to give continuity to the company trademark. It was no surprise then that at Fort Lauderdale great interest in the new open was shown by all, including Carlo Nuvolari and Dan Lenard who did the overall design of this new motoryacht with aluminium hull and with superstructures in vacuum stratified composite, a solution that ensures toughness but above all an indubitable reduction of weights. They took us round the boat in person. It was really very interesting because, although this Palmer & Johnson can boast undoubted aesthetic appeal - which alone was worth the price of the entry ticket to the event - the interior, in our opinion, is a valid example of rationality and functionality, obviously made precious by extremely rich and elegant decoration. 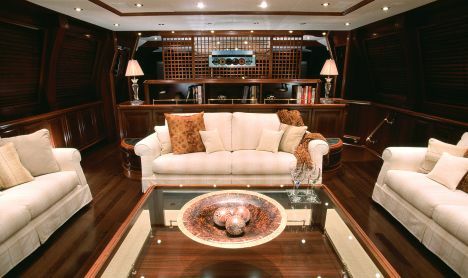 A boat which even below decks fully confirms the seaworthiness of its hull, in the context of an unequivocally classic flavour, furnished by specialists from the Raymond Hunt studio and embellished by extensive use of dark mahogany contrasted with light upholstery and marble. Nothing - safety aspects included - has been left to chance. 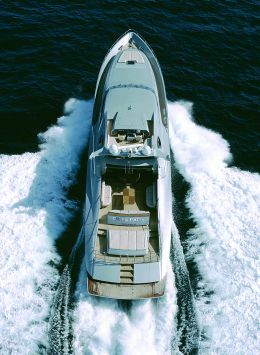 The PJ 120 is developed on three decks, the whole lower deck being the night- time area. Here, fully forward, is the owner's suite, spacious because it exploits the full beam at that point. 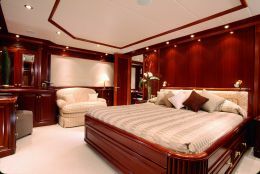 The double bed is slightly decentred to the left to make more room for the sofa and the furniture placed along the starboard side. The owner has a spacious bathroom, with double washbasin and separate shower, and another room fitted out as an office. Proceeding aft we come to the first guest cabin on the port side, with twin beds, and then two practically identical VIP cabins with obliquely positioned double beds. Over and above the en suite bathrooms there is another "daytime" bathroom on the starboard side, next to the companionway where access is gained to the night- time area. The crew have two distinct areas positioned respectively at the extremities of the lower deck, both with independent access to ensure maximum privacy for guests. The cabins are forward, with four beds and two bathrooms, while the dinette, galley and laundry are aft. Still on the subject of interiors, the main deck has a large day area, well illuminated by the large windows of the deckhouse. Entering aft there is, first of all, a round dining table seating eight, then a living area with facing sofas and a central coffee table. Lastly the galley which separates the indoor wheelhouse, also running the entire width of the boat, from the rest of the saloon. Outside, the cockpit is developed on different levels, descending aft and terminating in a "plateau" that is well integrated into the overall design of the vessel. Here too there is plenty of space and consequently comfort, the latter further enhanced by two sofas at the sides and a larger one in the middle with a shared table. 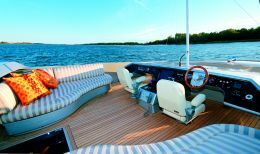 Farther aft, a large sundeck with space for up to six suntan enthusiasts. There's another sundeck fully forward on the deckhouse, next to the little "hangar" that houses both the tender and the davits for handling it. The third deck, defined "house top", is actually fairly small, designed exclusively to house the outdoor bridge. 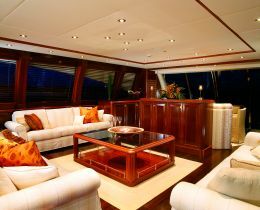 Aft there are two well upholstered sofas that make the area comfortable also for those who are not actually at the helm. Above there is a well profiled roll bar with the function of aerial holder.